Shot & Edited by Tomoo Kitsuta. My friend SHUX1 made this video of my show @ Yokohama "GOODDAYS". Take a look! Big up SHUX1 & "Music & Strength TV"! New arrival video from Miami! New arrival video from Miami! Thank you, Peter, Quake, & Cushy Gigs! Cushy Gigs + Shiro (Japan) from Cushy Productions on Vimeo. 先日アメリカのコネチカットに行って書いてきたNBAのチャリティオークションの出品作品です。平和を祈る気持ちを書きました。 Peace piece for NBA charity auction. Wishing peace for world... Mad Thanks, Billi Kid & Public Works Department! Public Works Department under license from the NBA presents a collection of artwork for the home or office entitled the "Art of Basketball". The collection, which taps a select group of leading graffiti and street artists, re-imagines the most iconic symbol of the game—the NBA backboard. 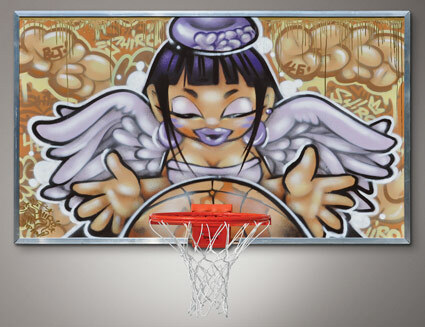 It is an effort never before explored within professional basketball and a milestone for graffiti and street art. The provenance of each original artwork will be numbered to 180 and confirmed with a signed Certificate of Authenticity from Public Works Department and the NBA. For future release information or an individual commission, please contact Billi Kid at bk@publicworksdept.com. Past work..